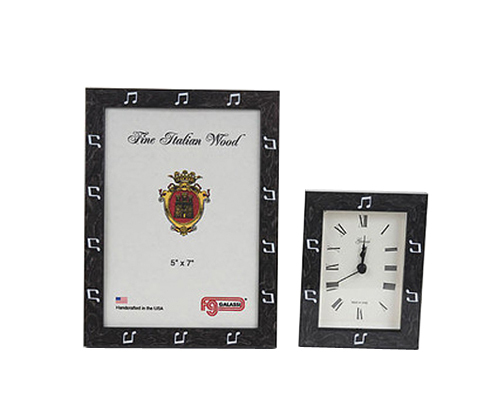 This is a Unique set of a Frame with matching clock. 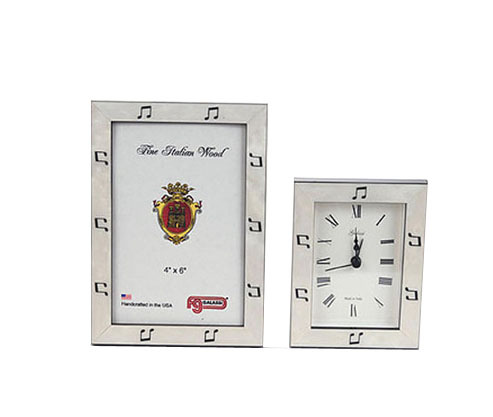 The photo frame measures 4" x 6" and the clock 3" x 4." Made in High Gloss Ebony finished Chestnut Burl with white notes or the reverse as White Finished Burl with Black notes, it is sure to delight. It is a Beautiful Upscale Gift, made in the finest Italian tradition here in the USA, by the FG Galassi Frame Company. It will grace any home or musical office beautifully! Also available in White with Black Notes. Double or triple frames can be ordered. Just let us know when you add to cart in the text box provided that you are interested and we'll email a quote to you. Allow 2 weeks for special order.